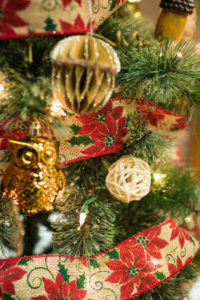 The 2019 Junior League of Duluth (JLD) annual Festival of Trees at the Duluth Entertainment and Convention Center (DECC) is Saturday, November 16 and Sunday, November 17. In the past this event has included over 170 vendors. Saturday, November 16 9:00 a.m. – 5:00 p.m.
Sunday, November 17 10:00 a.m. – 3:00 p.m.
JLD collects over 500 pounds of food for Second Harvest Northern Lakes Food Bank each year. Shoppers that bring in a food donation for Second Harvest will receive $1 off their admission to Festival of Trees. Festival of Trees is the JLD’s largest fundraiser. Proceeds go to support JLD and community projects. Other highlights of this event include JLD toffee and beautiful hand-decorated trees. Santa arrives with his sleigh on Saturday for pictures. Several live entertainment acts perform throughout the weekend. Please note: Payment-in-full OR a 50% deposit is REQUIRED at the same time as submission of your application to being booth assignment!